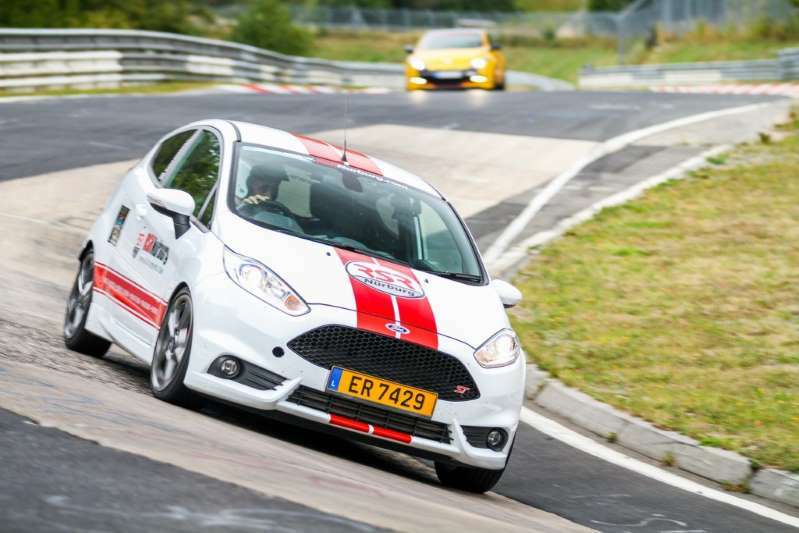 Heaven... Or how I lapped the Nurburgring 26 times (or more than 500km) in a Ford Fiesta ST. And you can too - here's what you need to know. IF YOU ARE into performance cars then of course you've heard of the Nurburgring, the famous bit of road in Germany that is the world's most dangerous and most difficult racetrack, and at 21km the longest. What better place to test a sports car? Automotive manufacturers around the world agree, which is why most of them test their cars at the track and some even have specialised test facilities nearby. But you don't need to be a professional test driver on a development programme to drive the 'Ring. You don't even need a racecar, literally anything will do on a Touristfahten (TF) day that's open to the public, like the time I turned up to collect my Ford Fiesta ST rental car from 'Ring specialists RSR. You could drive your standard rental car on the 'Ring, one from the likes of Avis or Hertz, but you'd be doing so without insurance. Even worse, many of the guys who spend their time videoing cars in the hope of catching a crash - which never takes long - also collect bounties for car rental companies, and if you're found on the 'Ring not only will your rental be cancelled but you'll be blacklisted as well, probably worldwide. Even if you're not, when you drive hard you'll overheat the brakes and boil the fluid, glaze the pads or create some other such issue which makes the car dangerous on track and on the road afterwards, and that's if you're lucky. So, rent a properly set up car from a specialist like RSR, or don't bother. Our ride for the day was a 2017 Ford Fiesta ST, one of the classic little hot hatches from a company that has a long history of hot-hatch success. Most Fiestas will spend their time on public roads, not racetracks, so you may well wonder what's been done to this one in order to prepare it for being hammered, every day, around the world's toughest racetrack by drivers from hack amateurs to professionals. Very little as it turns out, and in line with what we recommend for track days . All RSR do is change the brakepads to a track/street compound, replace the brake fluid frequently with high-temperature fluid, and change the tyres. To be honest, I'm not sure they even need to do that because the standard rubber on the Fiesta ST is Michelin Pilot Super Sports, which RSR change to Bridgestone Potenza RE050A. I guess they've got a bulk deal with Bridgestone, as that's the same class of rubber, a high-performance street tyre that can handle a bit of track work as opposed to a track-focused tyre like the AD08R, so in my view the change wasn't necessary for performance. And that's the setup done. The guys at RSR told me they like to keep the cars standard for reliability and warranty claims (yes, really), plus the car handles just fine without modifications. So all that means my test of the Fiesta is absolutely representative of the car you can see in a showroom, because the RSR 'Ring car isn't some race special that's had thousands of Euros thrown at it. Now you may be wondering why I opted for a Fiesta when I could have rented anything up to a Porsche 911 GT3. There's a couple of reasons. First is basic economics, as obviously the Fiesta is a lot cheaper and the excess is "only" 10,000 euros, not say 50,000 for a Cayman. It is also slower, and I agree with the maxim it is better to drive a slow car fast than a fast car slowly because you're too scared of the insurance excess to do anything exciting. And the limiting factor for me on a tourist day isn't so much the car or my ability to drive fast, it's my fear of what is around the blind corners - on the day I was there, the track was closed four times and every third lap there were yellow flags as some unfortunate visitor was scraped off the side of a wall. So given the complexities and inherent danger of the Ring, especially on a tourist day open to all comers, then the slower car makes sense. But lots of things make sense, and not many of them are fun. The Fiesta ST is both sensible and fun. It doesn't have a garish, ricer look-at-me style but there are subtle clues it is a bit quicker than normal, like the low-profile tyres and brakes. I prefer understated, and anyway this is no big-dog V8; it's a four-cylinder 1.6L engine that develops 134kW and 240Nm of torque, delivered to the front wheels via a six-speed manual gearbox, and the kerb weight is light at around 1197kg. Milk may indeed comes in less than two litres, but so does a heap of hot-hatch fun. The Fiesta has an overboost function too; in third gear and above the output is increased to 147kW / 290Nm for up to 20 seconds when at full throttle. Twenty seconds is a long time at full throttle in any gear, and as soon as you lift the timer is reset. Under hard acceleration from a standstill front-drive vehicles have to contend with something called torque steer which is fully explained here. It's not a major issue for the Fiesta, but I did feel it in first and second gears even though the overboost function wouldn't have been active. The new 2018 Fiesta ST have the option of a Quaife limited-slip differential in the front, which is a purely mechanical torque-sensing unit (no clutch plates), which Ford have tuned the usual brake traction control system to help, which means slightly braking a spinning or quicker wheel, a system their marketing people inaccurately call torque vectoring. Unfortunately, the RSR car didn't have the LSD, but with the high-speed nature of the Ring it wasn't essential and I didn't miss it - and this is coming from someone that races a front-drive car with a permanently locked differential. It would have been interesting to see the effect on straight-line acceleration though, and I'm sure the LSD would be helpful in slow-speed, tight corner exits. So as with any modern hot hatch you want to see some evidence of serious engineering between the front wheels to combat the power-on handling issues of front-drive vehicles and I suspect the LSD and electronic tune would do the job. The 0-100 time of 6.9 seconds is brisk, on par with the Toyota 86 or 2.0L Mazda MX-5 so while small, the Fiesta is not slow. Yet while it takes off nicely the Fiesta doesn't feel as straight-line quick as it is, although cars always feel straight-line slower on wide, purpose-built racetracks than on narrow public roads with lower speed limits, so real-world I doubt acceleration would be any concern. Another part of the sportscar experience is the cockpit. The Fiesta's front seats are comfortable, adjustable in all the right ways and one of the more supportive I've used in this class of car; I didn't slide forwards under braking, and lateral support when cornering was more than decent, although on track I always miss shoulder harnesses. The steering wheel is reach/tilt adjustable, and that combined with the seat adjustments mean anyone should be able to find their ideal driving position. I do wish the headrests could be adjusted to make wearing a helmet more comfortable, as they can be in the Toyota 86. The gearshift is nicely located, and all actions are precise. It's not the world's shortest-throw shift, but it's short enough and quick changes can be made, including via heel'n'toe shifting. There's the regulation strip in the top centre of the wheel, an example of totally useless bling which is thankfully rare on the ST, but the wheel's texture and the design means it feels natural to hold, and there's a decently easy to read to revcounter. Visibility is good, and the handbrake is easy to reach for those times when you need it at speed - a feature not tested, I should mention! Now onto the track. The 'Ring is a long, high-speed track, whereas smaller, nimble hot hatches like the Fiesta are best suited to short, tight circuits. However, the 'Ring is a great test as if the Fiesta can shine there, it can shine anywhere. And shine it did, not as brightly as a supernova but certainly enough to impress. The brakes were brilliant - effective, and easily able to modulate to the point where the ABS was just working. However, this Fiesta did have track/street pads so that would have made a difference. Ford have resisted the temptation of pointless fripperies like drilled rotors and instead opted for solid discs which don't look as cool, but the more metal there is in a disc the better it acts as a heatsink, which is exactly its job. Cornering is what a sportscar is all about, and the Fiesta turns in nicely, tracking pretty neutrally rather than pushing into understeer. Normally with front-drive, front-engine cars you can get a bit of turn-in oversteer under brakes, or lift-off oversteer on higher-speed corners. But not that day in the Fiesta, not even on downhill corners because the stability control wouldn't allow it, and insurance meant I had to leave it fully on. Yet I definitely felt the rear end trying to rotate and being smoothly restrained, so adjusted my style to suit. With the electronics off there'd be a little bit of lap time right there on corner entry if you were able to use that oversteer-entry technique, and that should carry through the corner to allow quicker rotation and therefore earlier application of power which means a quicker exit and a decent chunk of time per corner. But never mind the lap times, what's really important is the delicious feeling of balancing the car in oversteer under deceleration...that sort of playing is what makes track driving so thrilling. Nevertheless, it was clear that Ford has done a very good job on the electronics, as the intervention level is quite high even in Normal mode, only coming into play when necessary, and the corrections are subtle, barely scrubbing off any speed. It is possible to drive corners with the tyres squealing all the way in, through and out in Normal mode without any electronic intervention, and the times when the electronics were felt was as a result of my own untidiness. It was also important to note that any tiny corrections I made were complemented by the electronics, not amplified, although happily there were no YouTube-worthy 'moments'. Mid-corner the Fiesta settles well at any speed, and while radius is adjustable on the throttle like any car, I didn't find myself needing to do a lot of attitude adjustments, testament to how well the little hatch handles in the first place. Corner exit is again uneventful, readily tracking out without undue understeer. That said, as RSR say "there are no second gear corners at the 'Ring" (in a six-speed anyway) and you're never going to see the worst of torque steer in third, it'll be first and second. There's a few places at the 'Ring which are particularly good for testing cars. One is Escbach, a downhill run with a sharp drop-off that is a jump or close to it - certainly you feel the car go light, then soon as you land it's immediately into a fourth-gear double-apex right-hander. The Fiesta was assured throughout, the brakes providing plenty of feel and the suspension immediately composing the car ready for the weight shift into the turn. Also notable was Adenaur-Forst, scene of many a Ring fail video. Again, the Fiesta was composed and assured, pointing where it was bid through the 5th gear left even over the uneven road, then instantly recovering for a 4th gear right then the third gear left-right switch; its agility really shone there, aided by the relatively light weight. Heavier cars simply can't do that sort of rapid 3D-velocity change of speed, elevation, direction and gear even if they can manage higher top speeds. The ride was quite reasonably firm and suited to track work - I expect it'd be fine as a daily driver, but if you want Camry level plushness go buy a Camry. I don't have any criticisms of the Fiesta as a track car given its class as a cheap hot hatch. Of course, more power would be great, as would a lower, sportier seating position, and rear wheel drive...but carry on like that and you've designed yourself a Lotus Exige which is massively more expensive and nowhere near as practical. Should you want other sports cars Ford can offer you the bigger and more powerful Focus RS or Mustang, but frankly unless there was the chance to use the Mustang's rear drive to maintain a drift I'd rather drive the Fiesta on most tracks. The only time I really felt the Fiesta was underpowered was at Klosteral, and to be fair 5th gear acceleration up a hill is something cars way more expensive than the Fiesta struggle to manage, and it's not exactly something you'll ever need to do in Australia with the possible exception for a few seconds up Bathurst's Mountain Straight. And while big, heavy powerful cars are lots of fun at places like Bathurst and the Ring, they're cumbersome liabilities in motorkhanas, around tight little hillclimbs and not even as much fun on public roads compared to smaller, nimbler hatches. So let's sum up. After 26 laps of the Nurburging I can definitely recommend the Fiesta ST as a trackcar. It has the handling you want, the seating you need and electronic calibration that manages to be a safety net without undue disapproval. And most importantly, it's not just a riced-up sticker-engineered waste of space, it's built for the rigours of the track. I can't comment on daily-drive useability - we'll cover that in a test on local roads - but let's assume Ford's decades of small-hatch expertise mean the Fiesta ticks all the humdrum practical boxes. I can definitely see a small but strong market for the Fiesta ST, as many people want a practical, safe small-car daily driver but also consider life too short to spend time driving the likes of a Yaris. The Fiesta ST would not only make those tiresome errand drives a little bit less weary, but owners could also take it to the track knowing it's designed to deliver what you want there too. The new Fiesta ST is definitely confirmed for Australia in 2019, but Ford tell me that the specification hasn't yet been decided. It will be a significant update compared to the car I drove with a new engine, a 1.5L 3-cylinder turbo and six-speed manual; Ford Australia are deciding whether our cars should be 3 or 5 door, fitted with 17 or 18 inch wheels, and whether the limited-slip differential will be available. My view is don't bother with the 18s as the 17s are low-profile enough for handling and I wouldn't want a stiffer ride, I'd definitely want the LSD and as a parent, I'd much prefer the 5-door which is hardly any heavier than the 3-door. Because while the Fiesta can handle the Nuburgring, its real job is to bring joy to daily driving life.